Introduction to Woodworking is a nine week course that serves as the preliminary class in our three course furniture making series. Here you will have an opportunity to learn about the characteristics of wood and the basic principals of woodworking through lectures, demonstrations, and most importantly, practical application. Focusing primarily on the use of hand tools, you will learn how to use a saw, chisel, and hand planes. You’ll learn to sharpen chisels using grinders and water stones. You will learn to make a variety of joints, including: lap joints, bridle joints, and mortise and tenon joints. These joints will be used in the construction of your projects, which will be a sanding block, two picture frames, and an exercise in through dovetails. 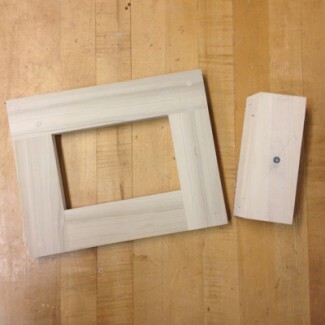 You’ll also learn to operate the hand-held router, and various hand-held power sanders while working on your projects. Thursdays, 6:30-9:00 pm, May 23- July 25. This 9-week session will span 10 weeks to include a break for the Independence Day Holiday. Enjoy the fireworks. The first of a three course series, Introduction to Woodworking covers the foundations of working with hand-held tools. Students will be given access to all tools needed for this course and all materials will be provided. You will be required to bring a notebook, pen and pencil. Although you will only be using hand-tools in this course, it is still recommended that you dress expecting to get some sawdust on your clothing. If you miss your class, you may attend any other scheduled class that week. We do not send out emails to let you know you have registered.